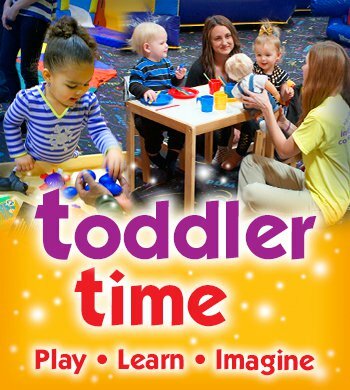 Toddler Learning Time is a fun one hour session filled with activities to strengthen fine & gross motor skills taught by our talented instructor - Includes circle time with a story, a craft related to the story and a snack - PLUS unlimited inflatable play time after class! Mom's agree - Toddler Time is the place to be! "We love Toddler Time! The projects are so cute and all the activities are perfect for my 2 year old. The unlimited jump on the inflatables makes the class a great deal, too!"